Exploring everything from cars to electricity, this fascinating follow-up to How Things Are Made—complete with gatefolds and lift-the-flap booklets—will engage curious young minds. 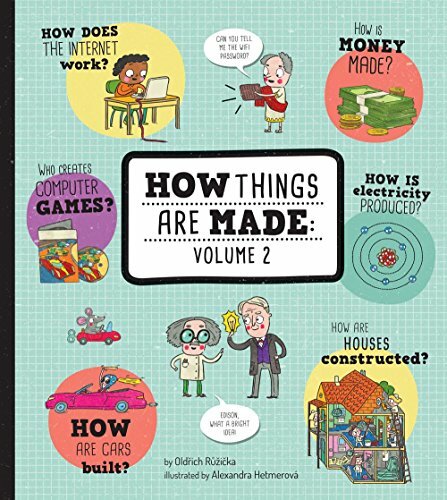 Children always want to know how things are made, and this fun and eye-catching book provides the answers. With six large gatefolds and lift-the-flap booklets throughout, it’s chock-full of engrossing and easily understandable bite-size facts that help demystify the world. Kids will learn how the internet works, money is produced, computer games are created, cars are built, electricity is generated, and homes are constructed. Young and inquiring minds will be fascinated, educated, and entertained for hours! If you have any questions about this product by Sterling Children's Books, contact us by completing and submitting the form below. If you are looking for a specif part number, please include it with your message.